Welcome to Tashun, ''The House of Peace,'' one of the most majestic and thoughtfully rendered properties in all of South Florida--and a towering example of what distinguishes Le Lac as an exclusive residential community without peer in Boca Raton.Cast on 6.3 exquisitely manicured acres, the aptly named estate charms with its tranquil lakefront views, serene spaces and lush, resort-style landscaping. To that end, it's a home that doubles as a getaway, making Tashun a great escape in every sense of the term.And yet, upon entering a dramatic foyer decorated with artwork that includes a showpiece chandelier, it's also evident that the beauty of this 41,010-square-foot masterpiece lies in the details.In addition to 7 bedrooms, 10 full bathrooms and 9 half baths, the Asian-inspiredproperty (27,832 square feet under air) features a state-of-the-art recording studio, an 11-seat theater complete with a concession stand, a custom-built sports bar, a gym, a separate guest wing-and a temperature-controlled underground wine cellar that can accommodate nearly 1,000 bottles. The open, contemporary design incorporates floor-to-ceiling windows throughout, inviting natural light at every possible turn. The ability to bring the outdoors inside reaches new heights in a grand living room with soaring ceilings accented with skylights-as well as in a sunroom with mammoth window panels that encircle and frame the casual seating area. A grand staircase leads up to the private suites, all of which include walk-in closets and en suite baths. The sprawling master bedroom opens up to a terrace that overlooks the pool area, the lake and the rest of the property. Its master bathroom, meanwhile, is cast in stunning marble elements - and also features a skylight. However, the second-floor highlights don't end there. A loft area includes several custom-designed chess sets and card tables. The aforementioned sports bar includes a 103-inch TV and personal sports memorabilia. Meanwhile, the grand library - with its handsome cherry wood bookshelves, and wall and ceiling treatments"offers a warm embrace consistent with the sense of serenity that permeates Tashun. The exterior spaces, designed with comfort and entertainment in mind, feature a private pool with cabana seating, a clay tennis court, lighted walkways, a children's playground-and an outdoor kitchen area with a wood-burning pizza oven. An "Everglades" room, named after the beautiful hand-painted views of the Everglades that adorn the space, elegantly separates the main house from the guest and amenities wing. The guest wing includes a spacious living room with a championship ping-pong table-and custom Olympic-style ping-pong flooring-along with two bedrooms with en suite bathrooms, a small kitchenette, a custom gym and a children's playroom (with two car simulators). 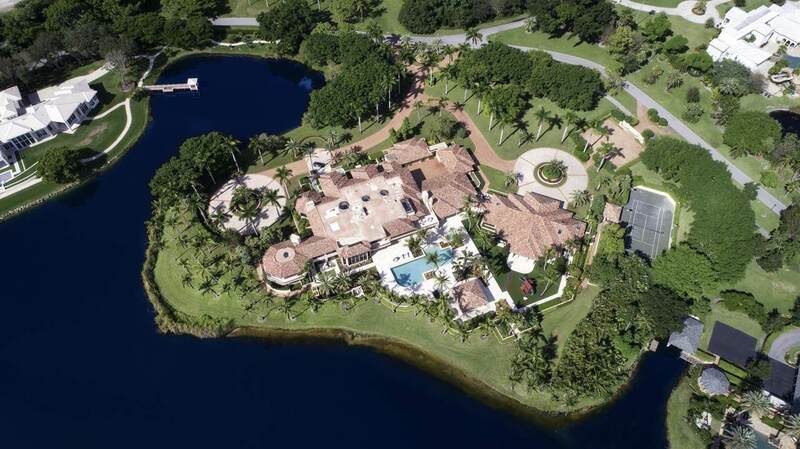 "The House of Peace" is one of 32 sprawling estates at Le Lac, which encompasses some 200 acres in Boca Raton. The community is surrounded by more than 60 acres of interconnected and independent lakes; its entrance is hidden from the main street, adding to its sense of exclusivity and privacy. Le Lac has redefined the luxury residential lifestyle for current and future generations. Don't create a home, create your own world.